Located in Mohave County, Lake Havasu is a special community within Arizona. Having a population of almost 55,000 residents, it attracts a wide variety of people year after year. Whether it's families looking to settle down in a progressive community, retirees who love the year-round warm temperatures, or college students enjoying spring break, Lake Havasu City has plenty to offer for people of all ages. For those who love a wide variety of attractions, there's no better place than Lake Havasu City. When it comes to attractions within the city, many people make their way to London Bridge. Purchased from London, England in 1968, the bridge was disassembled and brought to the city, where it was reconstructed and today is a popular tourist attraction. Along with this, the city also plays host to many other popular events. Because the city is a prime spot for boating enthusiasts, it's home to the International World Jet Ski Races, which attract thousands annually. Along with this, other popular events include the Havasu Island Hot Air Balloon Fest and Fair, the Havasu Half Marathon, and Winterfest, which is held every February and is two days filled with food, fun, and music. With a thriving economy and strong housing market, Lake Havasu City attracts many new residents each year. Retirees love the various condominiums and townhouses, while families enjoy the many new homes that have been constructed around the city. With plenty of parks and other open spaces, these subdivisions provide families with a great chance to settle down and build a wonderful life in the area. 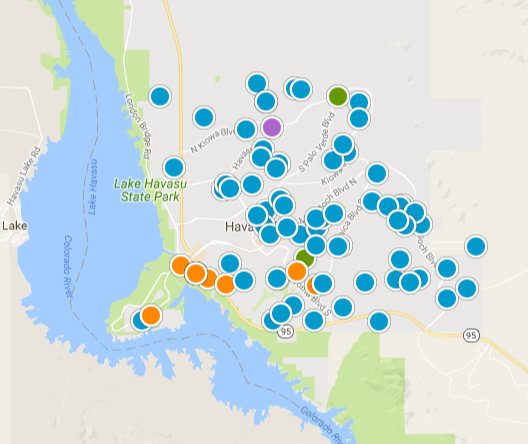 And along with great neighborhoods, Lake Havasu City is also known for excellent schools. Known for having great faculty that care about their kids, the schools have garnered awards for academic excellence year after year. As one of Arizona's most interesting cities, Lake Havasu City has plenty to offer those who call it home as well as those who are just passing through. Whether it's attending a local festival or settling down to raise a family, it's clear Lake Havasu City is one of Arizona's true desert treasures.